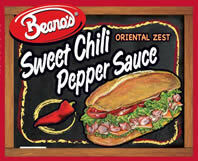 Mix the Beano’s Sweet Chili Pepper Sauce, peanut butter, and soy sauce until smooth and apply the mixture to the flatbread. Spread the cheese onto the flatbread, saving a little bit to sprinkle on at the end. Top with shredded chicken, peanuts, red pepper ribbons, matchstick carrots, and pickled red onion. Sprinkle the remaining cheese on top and put the flatbread in the oven for 10 minutes or until the cheese is fully melted. Garnish with fresh cilantro and lime and enjoy!